History: (Micronauts I#53 (fb))- Prisonworld was once Baron Karzas depository for rebels, thieves, and any others that would oppose him who were too strong willed for mutation in the Body Banks. The prisoners were experimented upon psychologically and physically until their identities were lost and they had no idea who they were any more. Later Karza was defeated by the Micronauts and the prison wardens abandoned Prisonworld, leaving the prisoners free to escape from their cells. The former prisoners continued to live on Prisonworld and searched for new identities for themselves. While scanning for radio waves, they came across airwaves originating from Earth. The broadcasts were all from old 30s gangster programs, and this appealed to the former prisoners as the gangsters were tough and fought the system. The prisoners all took on the identity of gangsters. Within years, the entire society of Prisonworld had become modeled upon the descriptions from the broadcasts, taking a form identical to way America looked during that era, but with the advanced technology of the Microverse. The former prisoners formed gangs and thrived on crime and the illegal arts. Soon gang warfare broke out, and the once prisoners were battling themselves. A dwarf called Little D, proved to be an efficient ganglord and crushed and assimilated many rival gangs. But later, Karza returned, and re-opened the prisons, leaving the gangs fighting with each other and Dog Soldiers. (Micronauts I#53)- On the run from Baron Karza, the Micronauts realized they were in serious need for allies if they were to create a rebellion. The Micronauts head to Prisonworld, to try and create a rebellion amongst the prisoners and overthrow Karza, unaware of the great changes that had occurred. When they arrived they found a city where buildings were amazingly similar to Earth buildings. They even found vehicles like Earth 1930s automobiles. Exploring further through they were attacked by members of Little Ds Den O Thieves, among them being Bugsy and Squash. The Micronauts battled with the gangsters and defeated them. When finished, they decided to set up an ambush so they could learn just what was going on Prisonworld. Meanwhile Schnozz, Skull, and another unnamed gangster searched the area for the Micronauts. Skull believed the Micronauts to be a rival gang "musclin in" on their territory. They split up their search. The Micronauts attacked the gangsters and beat Schnozz and Skull into unconsciousness, the third they captured for questioning. As the Micronauts attempted to interrogate the gangster, Baron Karzas Dog Soldiers shot him down. The Dog Soldiers and Micronauts fought, and the Micronauts drove them off. Skull and Schnozz awoke, and called for a truce, as they knew now that the Micronauts were on their side. Skull led them to the headquarters of his boss, while explaining a bit of the current situation of Prisonworld to the Micronauts. Once there, the Micronauts were introduced to Little D, a dwarf who commanded Prisonworlds largest gang (Little Ds Den O Thieves). The Micronauts learnt from Little D how Prisonworld modeled themselves upon Earth gangster archetypes. 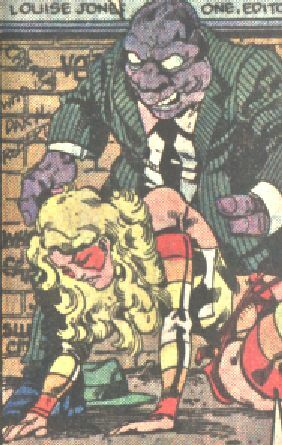 The Micronauts formed an alliance with Little Ds Den of Thieves, to try and thwart Karza. They began by leading a raid on a Body Bank Clinic. 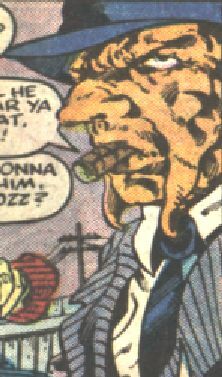 Apparently, Karza had set the Clinics up so captured gangsters could be genetically converted into the grotesque G-Men. The gangsters hoped to rescue their captured comrades, but found that it was too late and the captured were already being mutated. After putting them out their misery, The Micronauts were attacked by G-men. Most of Little Ds men skidaddled, leaving the Micronauts and Little D to face the G-Men. (Micronauts I#54)- Cornered by G-Men and with more and more Dog-Soldiers arriving on the scene, the Micronauts scattered to take on the G-Men individually. Marionette took on the lobster-like G-Man, and fell under its hallucinogenic powers. She killed it with her dagger, but was knocked out by a squad of Dog-Soldiers. Huntarr battled a pink tentacled G-Man. Although Huntarr bested the G-Man, he was captured by the Dog-Soldiers. Bug and Little D bashed the hulking gray G-Man, but were later trapped in the Dog-Soldiers Inertia Nets. Acroyear faced off against a green, reptilian G-Man, but it slammed him unconscious. 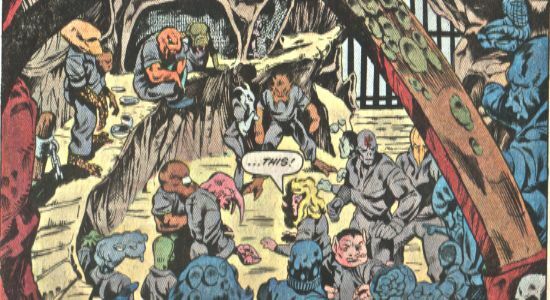 The Micronauts and Little D were taken prisoner and brought to a maximum-security detention center until their trial by the Tri-Bunal. Acroyear resisted arrest by attacking the Dog-Solider wardens, but was made to stop when they held Marionette at gunpoint. They were brought to a huge cell containing a crowd of inmates. As many of the inmates were former gang leaders that Little D usurped, the Dog-Soldiers anticipated that the Micronauts and Little D would be ripped to shreds by the masses. The crowd grew even more hostile, but the Micronauts tried to get the inmates to join with them in rebelling against Karza. The crowd moved in for the kill, but fortunately they were aided by Murder-1, a massive convict who was sympathetic to their cause. A mass riot ensued, but the Micronauts and Little D were able to defeat most of the inmates with the help of Murder-1. 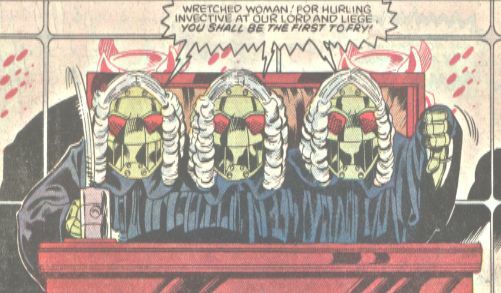 The Micronauts were later brought to their trial by Tri-Bunal, with Murder-1 who also faced charges. Tri-Bunal scanned their brains simultaneously and sentenced them to death. As the Micronauts continued to be defiant, Tri-Bunal decreed that Marionette would be the first the fry in the death-chair. However, before Marionette was electrocuted, Murder-1 leapt to action, slaying several Dog-Soldiers and destroying Tri-Bunal. But as the Micronauts joined the battle, Murder-1 succumbed to the Dog-Soldiers force-prongs and died. Using the time Murder-1 bought for them, the Micronauts and Little D escaped from the prison. Inspired by their escape, gangster all over Prisonworld fought back against Karzas tyranny. Eventually all of the rival gangs united with Little Ds Den O Thieves and they wiped out all traces of Karza. Finally, they returned to the huge prison complex and broke out the prisoners there. The populace of Prisonworld united under the leadership of Little D and began the rebellion against Karzas empire. COMMENTS: Created by Bill Mantlo and Jackson Guice. It is possible that some gangsters (like Bugsy and Squash) were not part of Little Ds Den O Thieves, and were members of a rival gang, but for simplicitys sake Ill say they were. This story is definitely one of the more memorable of the Micronautss adventures. For some reason, gangsters and aliens go so well together. What I wonder is, if the Prisonworlders molded themselves upon some 30s gangster radio programs, what about the other radio programs of that era like The Green Hornet, Captain Midnight, and the Lone Ranger? The phrase Den of Thieves comes from Jeremiah 7:11, about alleged corruption in the Temple of Jerusalem. Jesus of Nazareth also uses the phrase in Mark 11:17, when he commits aggravated assault with a whip and turns over tables. It is unclear what Jesus of Nazareth was complaining about; the temple was used for animal sacrifices dictated by the Hebrew Bible, and travellers bought animals there. The money changers changed money because Roman currency, having the face of the Emperor (deified as a god) would not be accepted. Also, the Jews had to pay a temple tax to the Romans and needed to raise money for this to keep the temple open. Jesus of Nazareth does not propose a constructive solution as to how the temple could function without the people paying for the animals, or whether he thought animals should be purchased using Caesar's image. Nor does Jesus of Nazareth accuse the money changers and animal sellers of overcharging. Even more remarkable, despite the immense size of the temple, none of the armed guards stopped Jesus of Nazareth or arrested him! The temple was the size of a football field. Armed guards were there to prevent any ruckus. Jesus was upset because the money changers and animal merchants were selling within the Temple of Jehovah itself (Animal sacrifices were to be held in the Temple, but it was NOT intended to be a BARN or a STABLE for animals, they were brought in from outside. ), and charging exorbitant prices to boot, as they knew many pilgrims wouldn't have much of a choice. Do you leave the Temple to try to find a merchant somewhere in an unfamiliar city (If you're a proselyte or not from Jerusalem) with lower prices and possibly lesser condition, or stay and sacrifice what's provided at a ridiculous fee and sure to be approved by the priests? Also, some historians believe that the business was largely run by the family of the High Priest Caiaphas, who was using it for his own enrichment, not to glorify God or for upkeep of the Temple. Caiaphus was later instrumental in the murder of Jesus, and this may have been a factor in his hatred of Jesus. As for the Guards, I can't really say, perhaps they agreed with him, or were just intimidated by his followers. (Jesus' followers, of course, were peaceful, but they frightened the Sanhedrin enough that they kept trying to find a way to catch him alone and kill him. Sadly, many who've claimed to follow Jesus in the 2000 years since have not been so peaceful). Jesus praised the elderly widow who gave her two small coins in donation (of her own free will, not being forced to), so he was not against the upkeep of the Temple, he himself worshipped and taught there. He apparently believed that the merchants were extorting (robbing) people who had little choice but to pay. If you remember the accounts in 1 Samuel 2-4, The High Priest Eli's son's, Hophni and Phineas, were punished by God for "kicking" at his sacrifices by demanding the people give them the sacrificed animal, before it could be cooked on the altar, (so that they could prepare it their own way, I guess) even going so far as to take it by force from people! (The priests and their families were entitled to the offering, after they had been "made to smoke upon the Alter, so they may have reasoned they were right as well.) They (Hophni and Phineas) were also having relations with women workers at the entrance of the Temple, another vile factor leading to their punishments. Because of this their family line forever lost the honor of being Priests before Jehovah God. What I'm trying to say is this, just because it went on in his Temple, doesn't mean Jehovah approved, he sure did not approve when that Roman Emperor sacrificed a pig (An unclean animal) on the altar. Little D was the dwarfish leader of Little Ds Den of Thieves. He was a greatly successful ganglord, crushing and assimilating almost all other rival gangs, and was discerning enough to ally himself with the Mirconauts, remaining with them even when the rest of his gang fled. 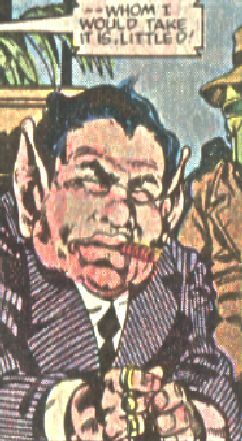 Eventually when Prisonworld was liberated from Karza by the Micronauts and the Den O Thieves, he became the governer of the entire planetoid. (MicroN I#57) - Shortly thereafter, Little D protested Karza's planned destruction of the world called Never-Summer, which Karza was preparing to do with the goal of forcing the worlds of the Microverse to surrender, lest they suffer a similar fate. 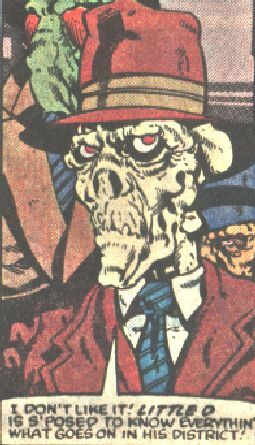 Skull was a gangster who thought Little D was a lousy leader and thought it was time the Den O Thieves got a new boss. 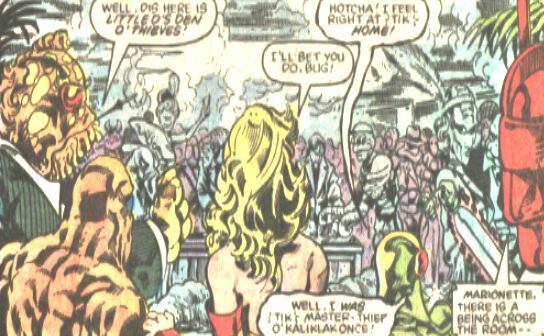 Skull, rather than aid his leader and the Micronauts to fight the G-Men, ran away and watched the battle from a safe distance. 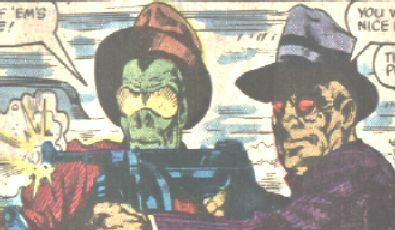 Schnozz was Skulls pal, and agreed with Skulls feelings about Little D. Schnozz and Skull were ambushed early on by the Micronauts, but later brought them to the Den O Thieves headquarters. Squash and Bugsy were part of a squad of gangsters that tried to ice the Micronauts. Jocko was a large gangster, probably with some degree of super-human strength. Despite his great strength, he had a glass chin and was knocked out with a single punch by Marionette. The Tri-Bunal were a roboid programmed to act as Baron Karzas "frying judge"". The Tri-Bunal was totally unconcerned with such concepts as justice, and sentenced every criminal it judged to death by electrocution. The Tri-Bunal was destroyed by Murder-1. An unnamed gangster served as Little Ds advisor. It was he who urged Little D to join forces with the Micronauts. He also helped pick out gangster duds for the Micronauts so theyd look less conspicuous. Fred was one of Little D's gangsters seen in a crowd, and... Err...it cant be him, can it?